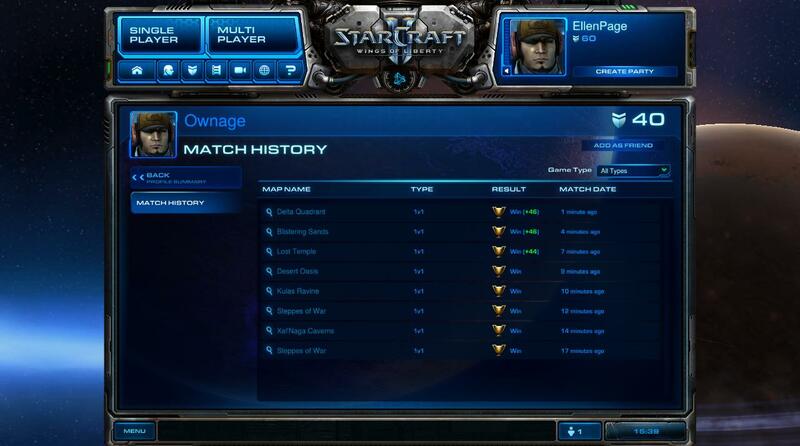 How does one get a tie game in Starcraft 2? I've seen "Tie" game results in others' match histories. When a game is considered a tie? Patch 1.3.0 changed the parameters a bit. I received a Tie Game once in a 3v3 league game. During the initial load before the match began, everyone was suddenly dumped back to the Battle.net menus (Battle.net did NOT go down). There may be other ways of getting one, but it looks as though getting dumped due to unknown server issues is one way. As far as I know, the only way for this to happen is in custom maps where no victory conditions are met (or the map designer didn't define any). I've never seen it occur in a melee (standard) game. If a melee game ends up in an in-completable state (i.e. A Terran player floats a building to an unreachable corner of the map and the other player doesn't have enough money to build a flying unit) it will come down to whichever person gets bored first and surrenders. even if you can continue to play it won't be able to send the results to Battle.net. this one has been actively being exploited by cheaters (desync opponent, let it report a win). How do I change the game speed during a match in Starcraft 2 (SC2)? Where do the third party stats sites get their data? How to effectively transfer to midgame tech in Starcraft 2? What does the message “Player is slowing down the game” mean? How can I view a live Starcraft II match in-game? What's with all the clicking the pros do in the opening minutes of Starcraft games? Why does the 'favored' rating change from start of game to end of game in Starcraft 2? What factors are considered when deciding whether someone is favored or not? Starcraft StarJewel how to spawn more marines? How does one obtain a Clan emblem in Starcraft 2?